Yesterday I was surrounded with great friends and family. We ate like it was an Olympic event, and laughed ourselves silly. After the mess was cleaned up, and everyone went home, I took time to reflect on how I felt…both physically and mentally. The best way to describe it is…calm and peaceful. I really had not thought about my pain levels, or my jaw locking all afternoon. For the first time in ages, amid the laughter and camaraderie, I literally forgot about tmj disorder. I decided to do some research on the “laughter is the best medicine” theory…is it true? Are there really health benefits to a hearty belly laugh? If so, what are they? Laughter lowers the levels of cortisol in the body. Cortisol suppresses the immune system. Lowering these levels enhances the work of the immune system and may help prevent disease. Laughter increases oxygen rich blood flow in your body, this is thought to be from the release of endorphins, which create a chemical rush that counters negative feelings and stress. Laughter is a great physical and emotional release, and is very cleansing. Just 15 minutes of laughter is equal to the benefits of 2 hours of sleep. 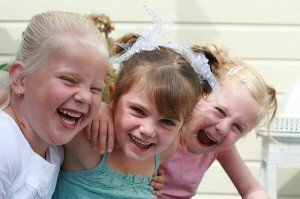 Laughter is a great way of taking your mind off of negative emotions. Laughter increases the number of antibody producing cells. This means a stronger immune system. Laughter exercises the diaphragm, contracts the abs, and even works out the shoulders….and leaves your muscles feeling more relaxed. A Stanford University studies show a good belly laugh can give you health boosting benefits equal to 10 minutes on a rowing machine! There is no question that laughter has powerful mental and physical benefits. Your sense of humor is your personal tool that helps you to navigate through the ups and downs of life with a little less wear and tear. So, did you hear the one about………………..